on Android devices (with Google Search and Chrome pre-installed) more than 95% of all search queries were made via Google Search; and on Windows Mobile devices (Google Search and Chrome are not pre-installed) less than 25% of all search queries were made via Google Search. More than 75% of search queries happened on Microsoft's Bing search engine, which is pre-installed on Windows Mobile devices. 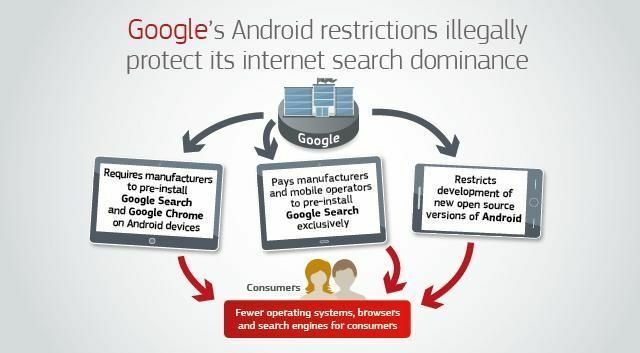 Google's practice has therefore reduced the incentives of manufacturers to pre-install competing search and browser apps, as well as the incentives of users to download such apps. This reduced the ability of rivals to compete effectively with Google.